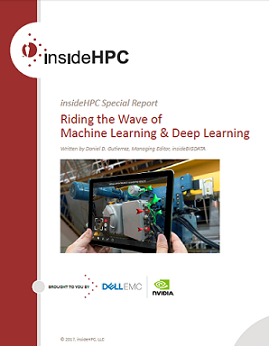 I’m very pleased to announce the availability of a new special technology report that I was contracted to research, develop and write – “insideHPC Special Report: Riding the Wave of Machine Learning and Deep Learning” sponsored by Dell EMC and NVIDIA. insideHPC is the sister publication (specializing in high performance computing) to insideBIGDATA where I serve as Managing Editor. The report focuses on how many companies are moving decisively to develop capabilities based on AI, machine learning and deep learning. In time-honored business fashion, the motivation is a combination of fear and hope. Competitive pressures are spurring companies on, and there is a sense of urgency among many enterprise thought leaders about not falling behind.